Have Tulle, Will Tutu You! Did you recently find yourself reading about tutu Tuesday and wish you could join in the fun? Are you embarrassed to shop for a tutu, bewildered by the thought of making one, and despairing of ever getting to wear one? Well... despair no more! catinthefunnyhat's tutu emporium* is here to save the day! All you have to do is say the word, and you can be the proud owner of a custom-made* tutu, absolutely free! *Size and length can be customized. Colour can be customized as long as you request a very specific (see below) shade of pale green, with optional black. A while back, I bought this pale green tulle to make a tutu for myself. I have lots of it left -- enough to make a couple more, I figure (maybe a few, depending on length and size). I also have some black netting -- it's not stiff like tulle; rather, its kinda drapey (I think it's mosquito netting). But it works nicely in combination with tulle. I would love to use these things up and in the process make a gift for a fellow ePlayan. If you'd like green or green-and-black tutu, please let me know. You can PM me your waist/hip size (measure around the place where you want the tutu to fit), the length you'd like it to be (the length of the tulle... which, remember, will pouf out a bit, so a bit longer than a skirt that would reach the same place), and whether you want all-green or green and black. 6" is probably the shortest I can make it, and the longest is about 2.5". It'll be first-come/first-serve, while supplies last. I promise the first one will get made; after that, it depends on time and materials. Re: Have Tulle, Will Tutu You! First ? I jus need to find mesure me ! Did i forgot to say the word ?? Lowz is my first victim customer. But I was looking at my tulle and realizing I can make at least a few more. So don't be shy, people! you're a sweetie ms. cat! I have 3 pettiskirts that I wear (or never wear actually) or else I'd take you up on your offer. It's not much work, and I'm really happy to be using up all this fabric. I've finished two so far, and the second one went much more quickly than the first. They're the no-sew style, so very easy indeed. I've got just about enough tulle to do ONE more tutu. It will have to be short and small 13" or less in length, and up to a 26" waist. If that sounds like the tutu for you, let me know. The short one is made with 1/2 width and about 13.5"long. It's 25% black. Because the black material is heavier and softer than tulle, it kinda hangs underneath. The long, all-green one is made with the full width of the bolt and about 27" long. Both are made for people with smaller waists than mine, so the elastic won't be stretched out and will be less visible. Haha... yeah, with the long length, it gets REALLY pouffy. AntiM wrote: I made a big wide tutu, the type you tie onto wide elastic. Took it out of the bin on the playa and it was all static. Tried to eat my head, then wrapped around my arms like an octopus. Larry and Genius were laughing at me. Never did wear the darn thing. Nevertheless, I have one for myself and am going to try it as well. I recommend you get a "tutu wrangler" to help you put it on (I can be that person, if you don't have someone else). I'm going to use a water-sprayer when I put mine on to try and get the static down (I was thinking of even packing it with a damp sponge, to prevent the static from accumulating in the first place). Worst-case scenario, we can go around on the playa dressed as Octopus attack victims, which might have its own charm. From now on, you can imagine my being attack by such an octopus whenever I'm in Da Bar. theCryptofishist wrote: From now on, you can imagine my being attack by such an octopus whenever I'm in Da Bar. What makes you think I don't already? Well, now you can do it openly. Third and final tutu is spoken for. OK, here is a picture of the 3rd and final tutu. It's too small for me to put on at all, so I had to get a wastebasket (ahem... waistbasket?) to "model" it for me. It's ultra short, with strands ranging from 7-11 inches long. Lovely!! That looks professionally done. Well done Cat. Cat, can you walk us through the creation process? I would love to make one to wear in the dust and the ones you made look great! Also, wear did you get the tulle and are they all pretty much the same? Thank you!! SquirrelHead wrote: Cat, can you walk us through the creation process? I would love to make one to wear in the dust and the ones you made look great! Also, wear did you get the tulle and are they all pretty much the same? Thank you!! Telling you the process is almost embarrassing, because it's so easy. I can foresee a cabal of Etsy tutu peddlers descending upon me in righteous fury, like a frenzied magicians on Penn & Teller or psychics on Randi. I got my tulle at a thrift store. It was crazy cheap... about $6 for, gosh, I figure at least 20 metres of material. I only bought the one colour; they had about 4 or 5. In retrospect, I should've bought it all and started a tutu empire . (I went back to try and buy more, and it was sold out. There's a children's dance school in the neighbourhood with a costume store, so I suspect all that tulle was a donation of old stock from them.) But, anyways, tulle is pretty cheap, and they'll have tonnes of it at any decent sewing store. I've seen it sold for just a couple of dollars a metre. To calculate how much tulle you need, multiply the waistline of the person who will be wearing it by 10.5 for a full-length tutu or by 5.25 for a mini. (Approximately. There's a lot of room for variation depending on how wide you cut your strips, how tightly you tie your knots, and how much you bunch them together. The numbers above reflect 7" strips and about 1.5 strips per inch of waistline, which was what I did). So someone with a 36" waist will require approximately a 10 yards of tulle for a long tutu or 5 yards for a mini. You'll also need to buy a length of sturdy elastic. The stuff I used is about 3/4" wide and has a lot of resistance when stretched. If you use a narrow, soft, or very stretchy elastic (like the stuff in underwear), you'll end up with it all stretched out of shape once the tulle is on. If you're unsure, ask someone who works at the sewing shop to help you; they'll know. STEP ONE: Cut a length of elastic equal or slightly shorter than the waist measurement of the person who will be wearing the tutu. Sew it together with a one-inch overlap, so you'll end up with a loop one or more inches smaller than the waist measurement. For a larger waistline, you'll want the difference to be bigger. This is because the weight and tension of the tulle tied to the elastic stretches it out a bit. I learned the hard way that using a loop equal to the wearer's waist results in a too-large tutu. For a 36" 'waist, I'd go with a band that's 34" around. STEP ONE: Cut the tulle into strips 6" or 7" wide, widthwise along the fabric. You don't need to be precise, but try to stay in this range. Too narrow, and your tulle won't pouf. Too wide, and it will be bulky around the waist. If you're making a mini, cut each strip in half to make two short ones. STEP THREE: Tie each strip of tulle in a slipknot (two half-hitches, actually) around the elastic. The knot should fall in the centre of the strip, lengthwise, so that the two ends hang down to the same length. Pull taut so the knot is nice and small, but not so taut that the elastic folds. Orient them all the same way, so that the knots all face either inwards or outwards. Push the tulle strips together as you go around. Continue until you have tulle strips all the way around the tutu. In the pic below, the knot faces inwards. In my tutus, they face outwards. Tie a few and decide which you prefer. STEP FOUR: Trim tutu to desired length. Do this carefully, measuring each strand before you cut. Remember that because the tutu is pouffy, 10" strands will result in a skirt much shorter than 10" of hanging fabric. It's best to have the wearer model the tutu and measure the length that ends at the right part of their body. VARIATIONS: Using two or more colours together results in a cool effect. You can alternate tulle with ribbon or other fabric (but be sure, if it is a fabric that frays, to hem it along all edges to prevent MOOP. Also, remember that the other fabric won't be as pouffy as the tulle). You can cut the tutu to in alternating lengths for a more fairy-like/ghostly effect. Or you can make a "mullet"-style tutu with shorter tulle at the front and longer at the back. Instead of using tulle fabric, you can buy tulle ribbon in 6" widths. That will result in a lot less cutting and more even/straight pieces, but I imagine it would be way more expensive. 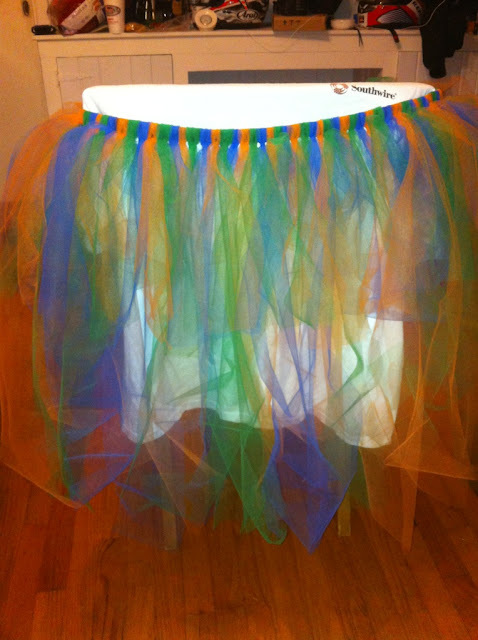 If the tutu ends up too large for the wearer, it's easy to shorten the elastic. Just remove a few strands of tulle, cut and re-sew elastic, and re-add the tulle strands you'd removed. Hmmm.... you know, you might want to check out some of the tutorials online for a better explanation. ...and many more. Google "no-sew tutu." You'll see some variation in techniques and styles, too. But one word of warning: At least one source told me to use elastic that was longer than the waist measurement, and that was most definitely WRONG. Good luck! Please post photos when you're done! For STEP THREE: Tie each strip of tulle in a slipknot (two half-hitches, actually) around the elastic - I read somewhere that its easier to expand the elastic around a chair before knotting the tulle. This sort of shows you the shape the tutu is going to take. Now you are just trying to tempt me. Yes -- the chair is a good idea. I didn't have one the right size, so I didn't bother with that. It worked out fine. But I think you'd want the chair to be the right size, i.e. not any bigger than the person's waist. Otherwise, you'll overstretch the elastic and force it to stay that way. I think I need to make a few adjustments but it is pretty much done. I like the colors, squirrelhead! Thanks BoyScoutGirl. I went with alternating lengths of tulle to make it a little different. I am debating on shortening the long ones a little. I think I need to tighten the knots and fit more tulle in but I am not sure. Also, I think the elastic that the lady at the fabric store said would work isn't heavy duty enough. It seems like it has stretched out just from me putting the tulle on. Sadly I think I am going to have to get new elastic and move all the tulle over. It should go faster now since I have more practice I guess. Also, I wanted to say thank you to catinthefunnyhat for posting her instructions. They were very helpful. Instead of cutting them shorter, could you knot them twice? That way if they're too short, you can undo the knot, flatten the tulle a bit, and have the original length back. SquirrelHead wrote: Also, I wanted to say thank you to catinthefunnyhat for posting her instructions. They were very helpful. SquirrelHead wrote: Also, I think the elastic that the lady at the fabric store said would work isn't heavy duty enough. It seems like it has stretched out just from me putting the tulle on. Sadly I think I am going to have to get new elastic and move all the tulle over. It should go faster now since I have more practice I guess. I totally ditched the idea of using elastic to make my tutu. I made mine on a ribbon and it works as a wrap on. I like the idea of being able to easily take it off... If I want to run to the loo, I can undo the tutu... and bam! life is so much easier. This is also so much easier if you want to change things about your tutu. I can't seem to decide on a tutu length, I have already undone mine twice and tried different things (still no success, but that's a different story).